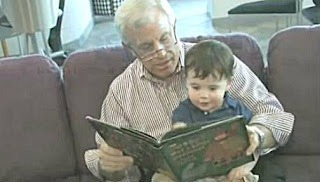 If you have a child between six months and eight years of age and live in a community served by the PJ Library, the child could receive every month, free of charge, a new age-appropriate children's picture or chapter book that teaches Jewish values, often including a humorous story. If you don't live in one of the 135 communities in the USA, Canada, and Israel served by the program, you can purchase a subscription for a child or grandchild for $60 a year, which will deliver one book a month by mail. Most of the funding for the program is provided by the Harold Grinspoon Foundation. The PJ Library is soliciting additional funds from sponsors, especially from communities that are not yet participating in the program. To us, this looks like an offer no one can refuse. Here's a video describing the program. Enjoy!